Slick throwback to the giant-mutant-insect movies of the 1950's. The story begins when a gardener becomes infected with a plant-borne insect larva, which he disgorges upon his arrival at the County Memorial Hospital. When the bug-baby ingests a large dose of growth hormone called NAC-5, it immediately bulks up to the size of a bulldozer. 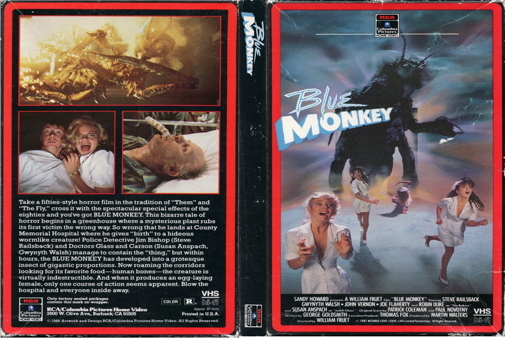 The plot quickly shifts into Alien mode, as scientists, police (namely wild-eyed cop Steve Railsback) and hospital personnel creep down the hospital's labyrinthine corridors in search of the insectoid monster, which they hope to destroy with conveniently-provided experimental laser equipment before it can test the capacity of the maternity ward with a few million larvae. The story is played quite straight -- more of an homage to films like Them! than a parody of same -- and benefits from good performances (John Vernon is great as the hospital director), a tight script and a strong emphasis on suspense and action from director William Fruet.